This year at the Knit and Crochet Show I was stretching my yarn crafting skills, so I decided to take a knitting class. Not only did I take a knitting class, but a knitting class with Galina Khmeleva. I was feeling a bit intimidated before heading to the class, a couple of my non-knitting crochet friends were saying “Whoa, your first knitting class and you are taking it with Galina?! You believe in jumping in the deep-end.” This did not help my nerves. When I got to the class I was comforted to see that I wasn’t the only crocheter that had ventured into a knitting class. My friends Amy D. and Susan Lowman were there as well as Haley Zimmerman and 2 other crocheters. It was a well-filled class. 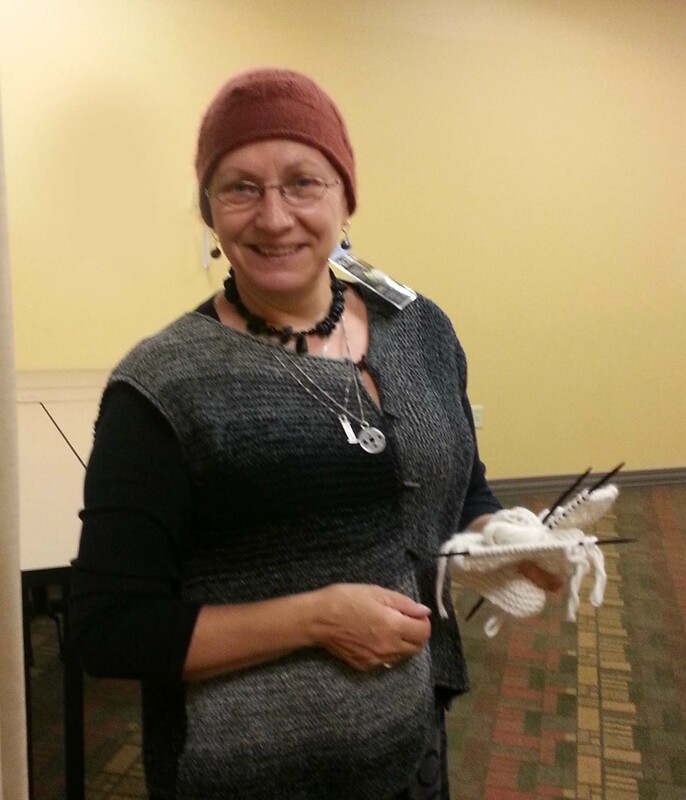 Galina started off the class introducing herself and her background with the needle-arts. I could tell that I was going to love the class, even if I didn’t remember anything. Galina had a warm and humorous approach to her subject and students that I found immediately engaging and re-assuring. I had been concerned that I hadn’t even cast-on to knit for months. Fortunately Galina started us off with teaching her favorite cast on method. The hand-out for this was illustrations from the book she learnt from in Russian. The captions on the illustrations were in Russian. I can’t read them, but it is rather amusing to look at them. Except for the very beginning of the cast-on, which created the slip knot, this method was very similar to the method I have learnt called the “sling-shot cast-on”. Once we all had 15 stitches cast on, Galina walked us thru the steps of how to wrap the yarn on our left hand and hold the left needle (for all us righties in the room, I don’t know if we had any lefties as I was very focused on my knitting). Then she showed us how to knit the working yarn. I swear it was like magic. For the very first time in my experience of knitting my hands didn’t begin to ache. No. Pain. At. All. I was thrilled. This method encourages one to keep the hands completely relaxed. I have always had difficulty with pain when knitting, and knew there had to be a way to do it that wouldn’t hurt. Biggest problem all of us crocheters were having was that our left pointer finger kept wanting to creep up off the needle. Galina would walk around the inside of the U-shape table and to almost every one of the crocheters she would say, “Finger down”. I don’t have much to show for my tiny little swatch I made in the class. But I was very pleased with my progress. 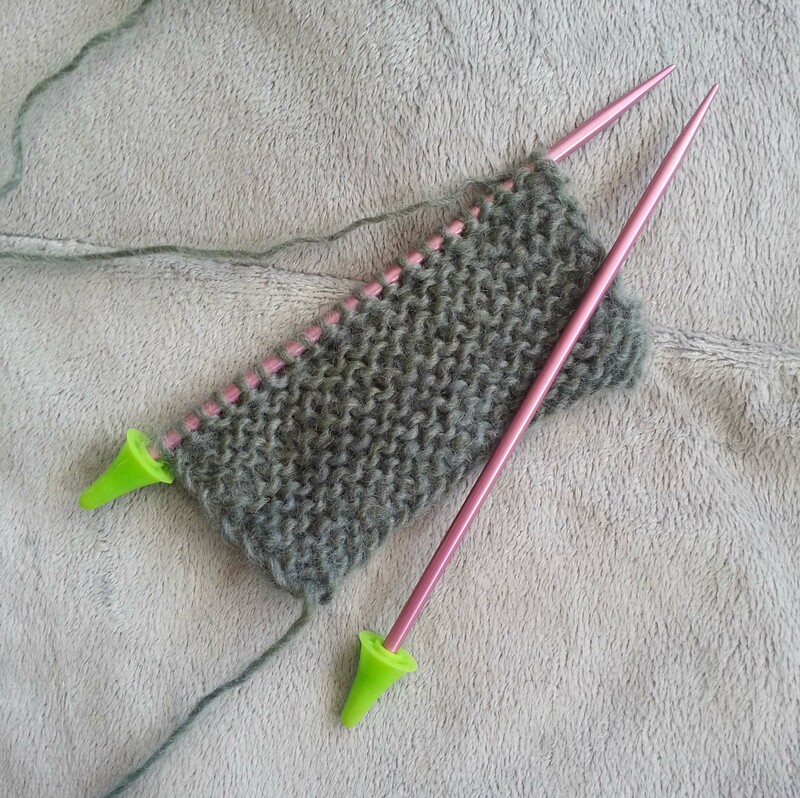 It will take many more hours of practice to develop any real proficiency with this method of knitting. Since my hands don’t hurt when I am knitting this way I might actually be able to put in the hours to improve. 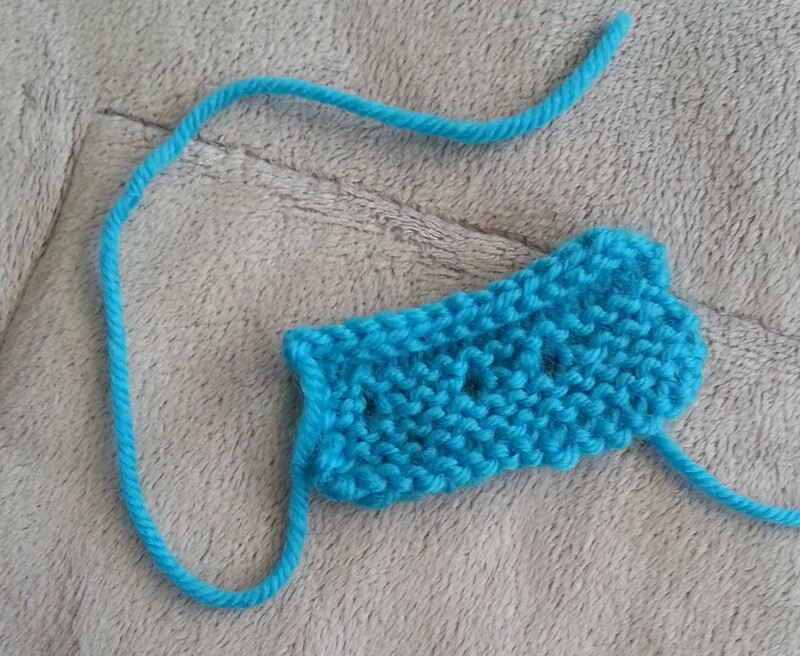 I’ve cast on 20 stitches and have been knitting a few rows each day. I’m still really pleased with this method of knitting. Best of all I now have a method of knitting I can recommend to knitters that are have hand-pain or problems when knitting. I’m very glad I had the courage to take this class, and would highly recommend taking a class with Galina, especially to my knitting friends that are more skilled than I am. If you want to take a class with Galina and are too impatient to wait til next summer’s Knit & Crochet Show, you can check out her DVD “Orenberg Knitting: Knitting Gossamer Webs” available thru Interweave. Or visit her website: Skaska.com to find out her teaching schedule.